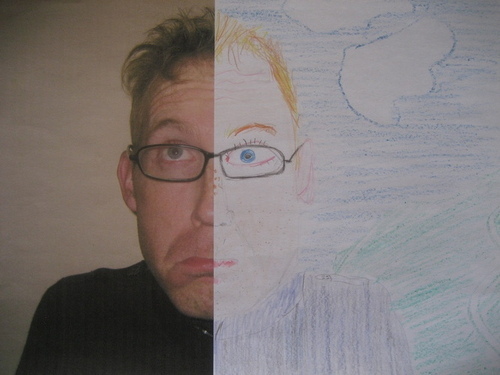 Cut a facial portrait down the center and remove half of the picture so that kids can fill it in themselves. Print a massive amount of JPEGs at once by putting them in a PDF. Importing the pictures to Picassa, straightening some of them and cropping others. (Yes, I know Picassa is not Free/Libre, but F-spot (in Ubuntu Hardy) is dog slow to display pictures and doesn’t have the straighten function). 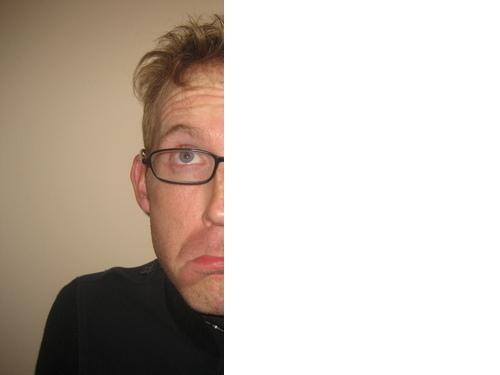 Exporting to a directory, then opening each file in GIMP and cropping the right-or-left hand side of the face away. Combine all the JPEG images into a PDF so they’re easy to print. The second time, we did the project at a school, for 60+ pupils. The straightening/cropping in Picassa took about ten minutes (since most of the pictures didn’t need much work). The open-crop-save-close process in GIMP took about thirty seconds per picture and was both repetitive and highly mouse intensive so that we both got hand cramps after a while. So, after watching Alex do the process for a second class at the school, I decided there must be a better way: automatic face detection. Lo-and-behold, five minutes of Googling got me to Torch3Vision, an image recognition toolkit with built-in face detection. It definitely works, but it takes quite a little setting up, so here’s a guide. So now we have a working set of face-detection programmes. The command line interface isn’t too friendly, so they take a little playing around. For starters, the binaries on my Ubuntu system don’t read JPEG images (although the code seems to be there, the build system is non-standard and didn’t automatically pick up my jpeg libraries. So, I needed to convert my images to PPM format, which is one of those image formats that no-one uses but somehow is the lowest common denominator for image processing command line apps. I use the program ‘jpegtopnm’ from package ‘netpbm’. 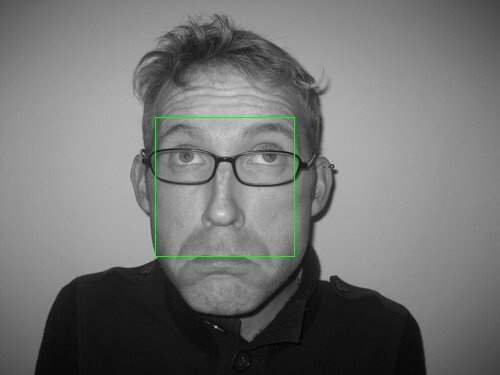 The other file ‘andy.pos’ contains the results of face detection. Line one is the number of detections, then each line has format x y w h, very easy to parse. I played around with the step-factors in the x and y directions to shave a second or so off the face detection routine, the values I chose were 0.1 and 0.2 respectively (I don’t need any accuracy in the y direction really, since my use is to cut the face down the middle). Then, since these are portrait photographs, I can speed up face detection by setting a minimum size for the face. I experimented and one sixth of the total image width gave good results – any larger and the face detection would fail with a crash. Adding this constraint provides better than 10X speed up, since the algorithm doesn’t waste time searching for small faces. 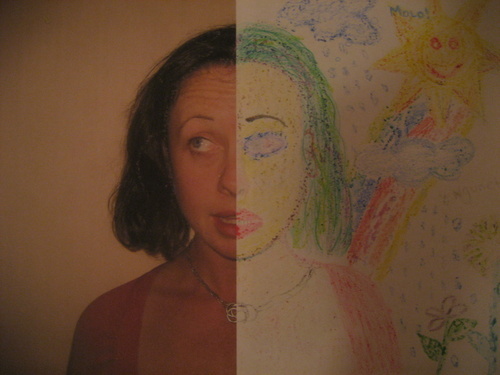 And finally, as promised, I’ll tell you how to blank-out one side of the face: of course, using Image Magick. Using the ‘chop’ or ‘crop’ commands didn’t work for this purpose, where I wanted the image to keep it’s dimensions but have one half just be white. So I decided to draw a white rectangle over half of the picture. I apply the image manipulation to the original JPEG file, not the temporary PPM file that I used to detect the face position. The script I am using to tie this all together. After processing all the portraits, I run a quick script to convert the jpegs to PDF and then join them into one master PDF file that I can easily print. The JPEG-PDF conversion uses Image Magick again (convert -rotate 90 file.jpg file.pdf). Joining together many PDFs into one document is easy with ‘pdfjoin’ from package ‘pdfjam’ (pdfjoin $tempfiles –outfile jpg2pdf.pdf). See the final jpg2pdf script. A work of staggering complexity. This entry was posted in Code, Life by andy. Bookmark the permalink.